The Great Strahov Stadium (Czech: Velký strahovský stadion) is a stadium in the Strahov district of Prague, Czech Republic. It was built for displays of synchronized gymnastics on a massive scale, with a field three times as long as and three times as wide as than the standard Association football pitch. It has a capacity of 250,000 spectators, of which is 56,000 seating, making it the largest stadium and the second largest sports venue ever built. Today, the stadium is no longer in use for competitive sports events; it is a training centre for Sparta Prague, and is used to host pop concerts. The stadium is sited on Petřín hill overlooking the old city. It can be accessed by taking the Petřín funicular up the hill through the gardens, or by taking tram lines 22, 23 or 25 to Malovanka station. The stadium has been on the list of UNESCO cultural heritage sites since 2003. Construction began based on plans by the architect Alois Dryák, on a wooden stadium in 1926, which was replaced by concrete grandstands in 1932. Further construction occurred in 1948 and 1975. The playing field, surrounded by seating on all sides, is 63,500 square metres. The stadium currently serves Sparta Prague as a training centre with 8 football pitches (6 pitches of standard sizes and 2 futsal pitches). The original stadium dates from the First Republic between the World Wars and served as a venue for popular Sokol displays of massive synchronized gymnastics. Construction of the first stadium began in 1926 on the current ground plan for the VIII.-Všesokolský slet. The stadium was modernized in 1932 for the IX.-Všesokolský slet. Both of these displays were attended by Czechoslovak President T. G. Masaryk, who had been a member of Sokol since he was thirteen, on his horse Hektor. 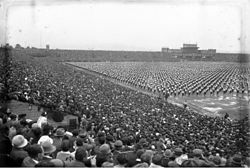 The largest attendance was recorded in 1938 on the occasion of the jubilee "World anti-war" X.-Všesokolský slet. A few days after the end of World War II (a few months after the end of hostilities in Europe), two units of the United States Army played a friendly match of American football. On September 28, 1945, a crowd of 40,000 watched soldier-athletes of the 94th Infantry Division defeat a team from the XXII Corps, by a score of 6-0. XI.-Všesokolský slet in 1948 was used as a protest against rising communism. Soon after, the Sokol was dissolved and followed Spartakiades. The Sokol displays were renamed Spartakiads during the communist era. The Spartakiads also took place in the Soviet Union, East Germany and Albania. Performances with several hundred gymnasts making various complex formations and exercising identically while accompanied by tunes from traditional folk music attracted the attention of many visitors. Some of the most popular shows were those of young well-trained recruits who wore only boxer shorts while on the display or women dancing in miniskirts. The groups of volunteer gymnasts (unlike the soldiers, who were ordered to practise and participate) were put together from keen local athletic association members who regularly trained for the show throughout the year prior to the event, which repeated every five years. The last Spartakiad was held here in 1985. Renewed XII.-Všesokolský slet took place here with the presence of Czech President Václav Havel in 1994. However, the next Sokol venues took place on the smaller stadiums (Stadion Evžena Rošického and Eden Arena). In 1990 at Strahov Stadium took place one of the greatest rock concerts of the Rolling Stones, which was attended by about 100 000 people, including former President Václav Havel. Since the 90's, the megalomaniac building had no use. The weeds and small trees grew on the playground, the ramps came into disrepair. The area was also used for exhibitions and trade fairs, and was here also demonstrated a collective equestrian sport polo. At the beginning of the 21st century appeared a tendency to demolish the stadium, but it was decided that it will be retained. In 2003, part of the stadium, with the financial support of the City of Prague, has been reconstructed by AC Sparta Prague. Eight football fields arose here and it is now used as a training centre for Sparta. In 2014, the complicated property relations of the stadium were resolved and it is now owned by the city. The 2019 Apple iPhone XR "Color Flood" commercial, which featured large numbers of people running in different colored jumpsuits, was filmed at the stadium. Since 1990, the stadium has been used for rock concerts. In the last decade several studies have looked at adaptive reuse and preservation of this unique structure. There are plans to convert the mammoth Strahov stadium complex into a commercial zone complete with hotels, restaurants and shops. Another suggestion is to convert the area into a "leisure mecca for the 21st century". There were plans to rebuild the area as an Olympic village if Prague won a future Olympic bid; bidding for 2016 was unsuccessful. ^ a b "Strahovský stadion kapacitou překonal jen římský Circus maximus". ČT24 (in Czech). ^ a b Satter, Andrew (11 December 2003). "Rethinking 'Fortress Strahov'". The Prague Post. ^ "Tomáš Garrigue Masaryk". PANOVNICI.cz (in Czech). ^ "Rolling Stones: dobře odvedená rocková show". Novinky.cz (in Czech). This page was last edited on 23 March 2019, at 09:25 (UTC).